An all-new Honda Adventure Centre is to open in South Wales next March, enabling people to experience the multi-terrain abilities of Honda’s adventure range of bikes. The news follows today’s much-anticipated UK unveiling of the new CRF1000L Africa Twin at Motorcycle Live. Offering customers a two-day riding experience on some of the UK’s most varied, very best motorcycling terrain, the Honda Adventure Centre, based on the outskirts of the Brecon Beacons National Park, will cater for people of all off-roading abilities, from enthusiastic novice through to seasoned adventure traveller. Honda Adventure Centre customers will spend their time exploring the Welsh countryside, getting to grips with a mix of gravel and dirt trails, water traps, rocky climbs and exhilarating descents. Africa Twin will head the line-up at the Honda Adventure Centre, on offer in both manual form and with the very latest incarnation of Honda’s Dual Clutch Transmission (DCT), including off-road ‘G’ mode, with incline detection. As well as the launch of Africa Twin, Honda’s adventure range of bikes, in general, sees a shake-up for 2016. The A2 licence-friendly CB500X will receive a significant makeover, to include the addition of adjustable preload on its front forks and new damping rates for the rear shock. The innovative, all-purpose NC750X is also set for an adventurous redesign, receiving new DCT technology, to include 3 levels of ‘S’ mode. It will also benefit from a suspension upgrade, with Showa’s Dual Bending Valves providing improved damping and more linear performance. As both bikes are launched, they will join the line-up of ‘X’ family bikes on offer for Honda Adventure Centre customers, providing a comprehensive riding choice. The package, to include bike hire, fuel, tuition, lunch on both days and an evening meal will cost £499, with a preferential local accommodation rate also offered for those who need it. To celebrate the launch of the Honda Adventure Centre, a special show discount of £75 will be offered for all those who make a booking via the Honda Adventure Centre team on the Honda stand, 3B20. 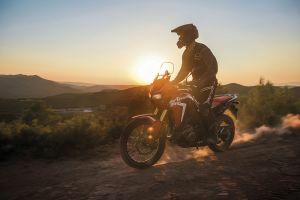 The opening of the Honda Adventure Centre complements Honda’s existing experience offering, adding an adventure riding element to an already varied range of riding packages. At the Ron Haslam Race School – celebrating 20 years in operation – budding racers from the age of 12 can hone their skills on the Donington Park Grand Prix Cicuit. Dave Thorpe, through the Dave Thorpe Honda off-road centre, already offers people a number of off-road adventures, with the opportunity to ride a vast expanse of enduro trails, have a go at trials riding and sample motocross on an all-weather track, coached by four times British champion Stephen Sword. To find out more about the Honda Adventure Centre and to make a booking, visit hondaadventurecentre.com. For details on CRF1000L Africa Twin and to register your interest or place an order, visit Honda.co.uk. Bookings for Ron Haslam track experiences can be made at haslamraceschool.com and off-road packages are on offer at davethorpehondaoffroad.com.